We have previously posted our extensive research into UBS Financial Services of Puerto Rico’s closed end funds – some of which were co-managed and sold by Popular. A summary of our UBS posts as of February 12, 2015 can be downloaded by clicking UBS Puerto Rico’s Bond Fund Debacle: What We Know so Far. That summary is also available in Spanish by clicking Lo que Sabemos hasta Ahora de la Debacle de los Fondos de Bonos UBS Puerto Rico. Two subsequent UBS posts can be accessed by clicking UBS Puerto Rico Still Can’t Shoot Straight from October 30, 2015 and UBS Puerto Rico’s COFINA Conflicts Were Even Worse Than ERS Conflicts from October 24, 2016. The UBS Funds suffered dramatic losses since 2013 because of the decline in Puerto Rico municipal bond prices, the Funds’ 2-to-1 leverage and their concentration in Employees Retirement System bonds UBS underwrote. There have been nearly 2,000 FINRA arbitrations filed in Puerto Rico as a result of losses related to the UBS/Popular Funds, the Santander Funds and Puerto Rico municipal bond losses generally. Our report on these arbitrations can be downloaded in English by clicking Puerto Rico Securities Arbitration Report: 1874 Arbitration Filings, $226 million in Settlements and Awards so far and in Spanish by clicking Reporte de Arbitrajes de Valores en Puerto Rico: 1874 Reclamaciones de Arbitraje, $226 millones en Acuerdos Transaccionales y Laudos Arbitrales Hasta la fecha. Santander’s Funds had the same (and more) defects and suffered similar extraordinary losses as the UBS and Popular Funds. This post describes the Santander Funds generally; subsequent posts will callout specific funds. 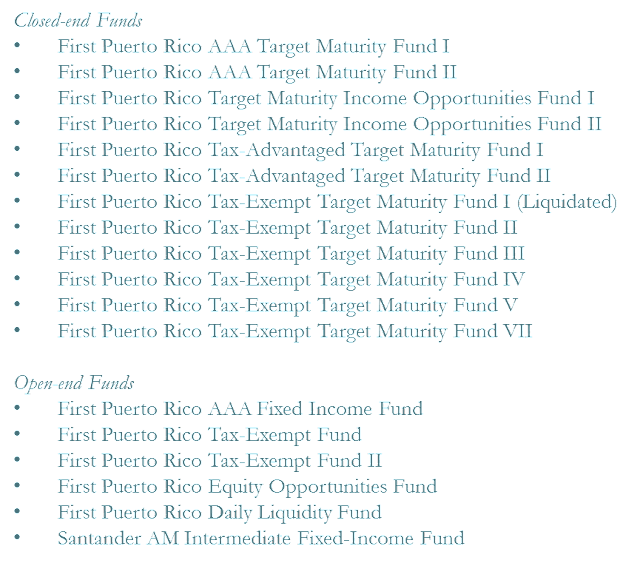 Santander sold at least twelve closed end funds and six open end funds in Puerto Rico, branded “First Puerto Rico” Funds. See Table 1. The inception dates for Santander’s closed end funds are listed in Table 2. There is an interesting story buried in these inception dates which we will develop further in a subsequent post. For now, notice that the first 11 of 12 funds commenced operations in the period from May 30, 2001 to January 12, 2005. On average, Santander launched a new fund every 4 months during this 3.6 year period. There was then a 7.8 year gap before the last fund, Tax-exempt Target Maturity Fund VII, commenced operations on October 31, 2012. 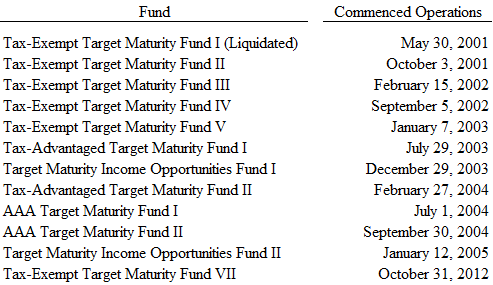 Also, notice that there is no Tax-exempt Target Maturity Fund VI in Table 2. Santander registered the Tax-exempt Target Maturity Fund VI on April 5, 2003 but Puerto Rico’s Department of State canceled the Fund’s certificate of incorporation in 2014 for failing to file annual reports or pay annual dues for at least the years 2008-2012. 1) Why did Santander wait 7.8 years to register another closed end fund after registering 11 funds in less than 4 years? 2) Why did Santander liquidate Tax-Exempt Target Maturity Fund I in August 2012 by selling all the assets and distributing $10.07 per share when the fund was supposed to distribute the assets as they matured, were called or redeemed between June 2012 and June 2017? 3) Why did Santander launch another leveraged closed end fund to hold more PR municipal bonds as those bonds became substantially riskier in November 2012 after shuttering Tax-Exempt Target Maturity Fund I rather than shrinking the size of existing funds by deleveraging existing funds and through share repurchases? 4) What happened to Fund VI? Did it raise any money? Did it ever file annual reports and pay annual dues? If not, why did it take OCFI twelve years to cancel VI’s certificate of incorporation? Table 3 lists the total and net assets of eleven of the twelve closed end funds listed in Table 2 plus two open-end funds (Tax-Exempt Fund and Tax-Exempt Fund II). The Tax Exempt Target Maturity I is not included in the list because it was fully liquidated by August 2012. Overall, these thirteen Santander Funds had slightly more leverage than the UBS Puerto Rico Funds and the two Santander Open End Funds were the most leveraged by a small amount. Santander marketed the funds listed in Table 3 for investors with an investment objective of high current income consistent with preservation of capital. Table 4 is a screen shot of the December 31, 2012 Fact Sheet for the Tax Exempt Fund. Each Santander Fund’s quarterly Fact Sheet, Annual Report and Prospectus had similar “capital preservation” language. Investors in the Thirteen Santander Funds Lost Nearly $1 billion from 2013 to 2015. Table 5 reports the losses suffered by investors in the 13 Santander Funds listed in Table 3. Setting aside the two AAA funds, the NAVs of the remaining eleven funds marketed for investors wanting capital preservation declined 56% on average and the prices dropped by 64%. Given the relative size of the Santander and UBS/Popular Funds and their relative losses it is surprising that less than 200 arbitrations have been filed against Santander in Puerto Rico while 1,500 have been filed against UBS PR to date.